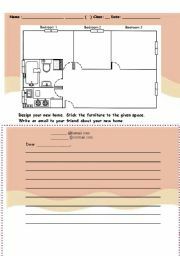 The is a cut and paste worksheet for students to design their own appartment. They also have to write an email a friend and talk about their new home. 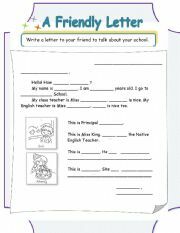 Using letter form to consolidate the use of personal pronoun "he","she" and the capitalization of Proper nouns like people´s names and places. This is a class activity. 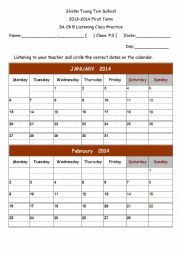 Teacher reads aloud the date and students circle the answer on calendar. 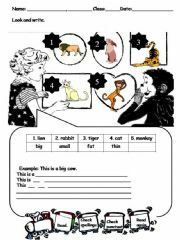 This is a worksheet to encourage students apply plural form. I need my kids to design the zoo name and even some new animals. It should be a fun task for them. This is a powerpoint for revise some of the job´s names. It also encourage kids to use third person singular verbs to describe people. A story to let students know we should help each other �C especially we should help those who have lost one of their senses. 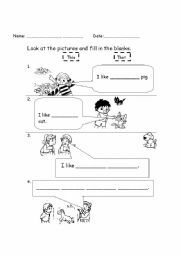 This is an editable writing worksheet.